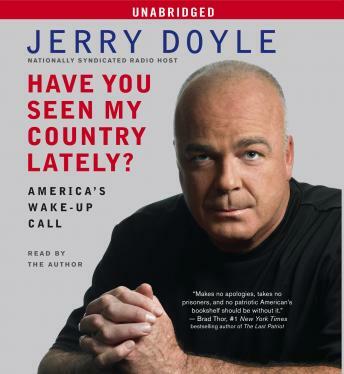 From his childhood in Flatbush, Brooklyn, his career in aviation, to his time on Wall Street and departure to Los Angeles to become one of the lead actors on the Emmy Award-winning hit show Babylon 5, then stepping into the political arena as the Hollywood Republican Nominee for Congress in the 2000 election, and now as a talk radio host, Jerry Doyle’s experiences from career to career and coast to coast have molded his political opinions and made him one of the most popular radio hosts in the country. Now, with Have You Seen My Country Lately?, Doyle tackles the tough political issues our country is facing with his independent views and trademark wit. Doyle addresses what needs to be done to get America back on the road to liberty and prosperity. The audiobook explores the financial crisis, analyzing the anatomy of an auto industry takeover, exploring American sovereignty, and the 1960s radical politics that are alive and well in our government today. Using humorous anecdotes from his colorful life, Have You Seen My Country Lately? features chapters, “Smoke for the Children,” “Economic Fascism,” “TARP This,” “Drain the Political Swamp,” and “You’re Not Someone Special.” Doyle delves into the absurdity of government policies, while bringing key issues to light and offering his solutions on how we can bring about the changes we really need.